"The secrets function less for the concealing of information than as a bonding mechanism for members," write the authors of As Above, So Below Art of the American Fraternal Society, 1850-1930, a new book about the golden age of secret societies in America. 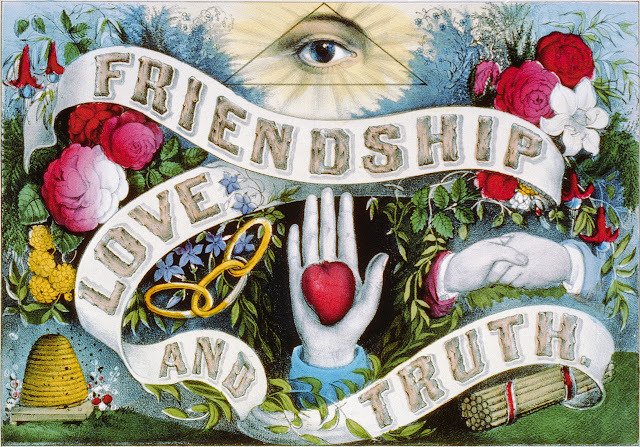 These groups functioned not unlike street fashion or indie music—in which secret societies have contemporary corollaries—by offering experiences cloaked in hierarchy and mystery, designed to bond members together and transform their lives. There were lithographs depicting dreamy allegories told through beehives (symbolizing collective work and hierarchy), skeletons (symbolizing mortality), and hands holding red hearts (symbolizing charity), awash in Romantic colors, meant to be hung in members’ businesses as subtle advertising.